Cesky Krumlov Regional Museum administers over 22 000 registered items of the collection fund and another 34 000 objects. There is over 5 000 books in the library. 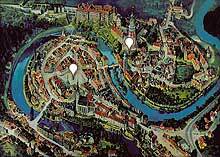 You can find here ceramic model of the Cesky Krumlov historical centre. Various exhibitions take place here. Regional Museum is located in a large building of former Jesuit seminary located at the end of Horni ulice (street) right next to the bridge of the former Horni Brana (upper gate to the town). The Regional Museum is the oldest early Baroque building in town, built with its decorative fa�ade on the site of six older citizen homes from 1650-1652. Together with the theatre and the college create a part of dominant complex of the Jesuit Order, invited to Cesky Krumlov by Vilem of Rozmberk in 1582. In 1773 the activities of the Jesuit Order were dissoluted. Until 1945 the building served for educational purpose, first as a German school, than as a girls school and local German gymnasium. Next to the gymnasium was court with vista terrace and a garden which was used for sport, relaxation and study as well. The building has been used as an archive and museum since the end of the Second World War in 1946. In 1952 the first museum exhibition was opened to the public. The current look of the building is the result of a complete reconstruction from 1970-1980. After this changeover exhibition rooms and work areas of the Cesky Krumlov Regional Museum were opened to the public. Find more about Regional Museum in Cesky Krumlov.